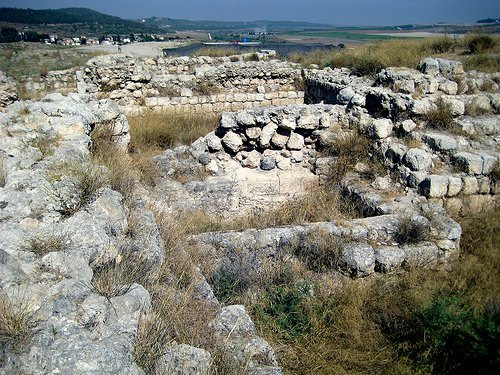 One of the more interesting archaeological sites that you can visit in Israel is the Tel of Bet Shemesh. Bet (House) Shemesh (of the sun) is located in the Shephelah of Israel, which are the low foothills that separate the coastal plain from the mountains. This city site has been almost continuously occupied since the Bronze Age, 5000 B.C.E., both by Canaanites and Israelites. The area around Bet Shemesh was originally given to the tribe of Dan when the Israelites entered the Promised Land. The tel guarded the important Sorek Valley which was a natural land route up in to the mountains. This area has been fought over countless times throughout history. Archaeological digs have confirmed that the city was destroyed and rebuilt at least six times. The Sorek Valley and Bet Shemesh were the site of two important biblical stories, Samson in Judges 13-16 and the story of the loss and recovery of the Ark of the Covenant to the Philistines in 1 Samuel 4,6. Both stories occurred in this valley and both stories involve the Hebrews struggle with the entrapments of the pagan Philistine culture. It is fascinating to sit on the archaeological digs and look up and down the valley and imagine what took place here in times gone by. What does this ancient city have to do with the title of the story, No Pig Bones! When the archaeologists excavated this site, in almost every level of civilization that they encountered, the debris was full of pig bones. Since pigs were forbidden by God for the Jews to eat, there was obviously some serious compromising of the Hebrew faith in these cities! They were obviously adopting the lifestyle of the pagan nations around them and were failing to be true to the commandments given to them by God. 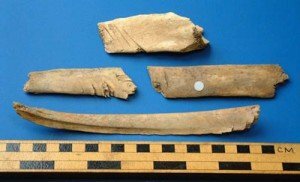 Only in the time period of Hezekiah, the famous Jewish king who brought the country back to God, did they fail to find a significant amount of pig bones. What is the faith lesson here? What are our pig bones? What are the things that we have adopted or taken in from the worldly culture that compromise our Christian walk? Can we dabble in the pagan culture a little bit; eat a little pig meat and still be all right? Does participating in the worldly lifestyle a small amount make that much difference? If they excavated our house in a future time period, what evidence would they find that we only served the one true God? This is a powerful reminder to us as Christians that we must not be compromisers! We must be obedient and be an example to the pagan lifestyle that surrounds us. God is expecting us to be a witness! (Isaiah 43:10-12) No pig bones! On day 9 of our trip to Israel, we took an early morning hike down to the banks of the Jordan River. The name “Jordan” comes from the Hebrew word that means,”To descend or go down”. 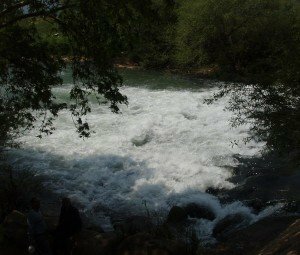 The Jordan River is not a big river by American standards, but it is a strong and swift river for its size. From its origin on the slopes of Mt. Hermon (9000′ ft. above sea level), it drops over 900 ft. in the ten miles it takes to get to the Sea of Galilee. Then it flows another 90 miles to the Dead Sea, which is over 1400 ft below sea level. This makes it one of the fastest flowing and descending rivers in the world. The Jordan is the most frequently mentioned geographical feature in the Bible, occurring 181 times in the Old Testament and 32 times in the New Testament. Two very significant biblical events occurred here, the crossing of the Jordan by the Israelites into the Promised Land, and Jesus baptism in the Jordan by John the Baptizer in the New Testament. Water, to a biblical character, was not the same as it is to people today. Water was scarce in these desert lands and there was never enough to swim in or to be comfortable being around. Water, to these desert people, was a barrier to be crossed and an obstacle to overcome. The Israelites believed that the Devil lived in the abyss, in the bottom of the lake. They were afraid of the water and what it represented in their world. When the Israelites reached the banks of the Jordan, they were facing an almost insurmountable obstacle. The Bible says the Jordan was at flood stage and in this particular area the banks are very tall and steep. To complicate matters, none of the Israelites could swim. They were standing at the brink of something great that God had promised them, but they had a huge barrier to overcome to receive that promise. In Chapter 1 of Joshua, God encouraged the leadership and the people to,”Be Strong and Courageous”! “Even though you haven’t been this way before, I have and I know the way”! God was asking them to trust Him to take them to a place that they were afraid to go on their own. Now, can you picture the Priest and Levites with the Ark of the Covenant, standing on the edge of the steep banks, looking down at the flood stage waters of the Jordan? When does the Bible say that the river divided? When they took the plunge! God required them to have “wet feet”! They had to slide down the bank and get into the river, where they couldn’t swim before God would divide the water. How does this apply to us and our walk of faith? We often have a sense that God is calling us to do something that is beyond our comfort zone. We don’t like the unknown. We want God to open all the doors, show us the path and then place plenty of road signs along the way to assure us. Otherwise, we are afraid to go. This Bible story shows us that we often have to just “go for it’ and take the plunge! God won’t act until you jump in! He needs to see if you will trust Him to take you to a place that you haven’t been before. If not, don’t expect God to divide any rivers in your life! Go For It! I’m Diving In, sink or swim, I’m Diving In! On the east side of the Sea of Galilee is a huge, well excavated ancient Greek city named Beth Shean, founded by Alexander the Great in 330 BCE. It was one of the ten cities known as the Decapolis, which in Greek means ten cities (deca-polis). These ten cities were placed in this region by the Greeks when they conquered the known world to spread the Greek lifestyle, known as Hellenism. Beth Shean is one of the oldest cities in the region. Several Old Testament stories occurred in this area. In 1 Samuel 31, Jonathan and Saul were killed on Mt. Gilboa near here in a battle with the Philistines. Their bodies were taken to Beth Shean and hung on the city walls there. The city is located on the main road from Nazareth down to Jericho and up to Jerusalem. Jesus would have walked right by here and would have been very familiar with the town and its inhabitants. .The Greek culture glorified the human body and the human mind. Hellenism taught that man was the ultimate in the universe, and what his mind could conceive, he would achieve. The goal in life was for the human body to be satisfied, your accomplishments, pleasures and successes. All these major venues were located on these two wide roads. Can you see how opposite the teachings of the Torah were to this Hellenistic life style? This way of life permeated the lives of all the cities in Israel and was a constant attraction to the inhabitants. It was a completely opposite world view to what the Torah taught. Now, can you envision more clearly what Jesus was saying when he said,” wide is the road that leads to destruction and many enter through it”? Was he talking about Cardo and Decumanus? Jesus called us to walk the narrow road of obedience to God. It’s not hard to understand why that road is less traveled. The trappings of Hellenism are just as attractive today and many people are going down that wide road. As 21st century Christians, we are to live a straight and narrow lifestyle and to be a witness to a lost, Hellenistic society, just as Jesus called his disciples to live that way so long ago.